Broccoli rabe, known in Italian as rapini, is closely related to broccoli but is most commonly used as a cooking green. It has a sharp, bitter flavor that people tend to love or hate. Some bunches of broccoli rabe have more or larger florets that look like broccoli – these can be cooked along with the greens and add great texture to the final dish. 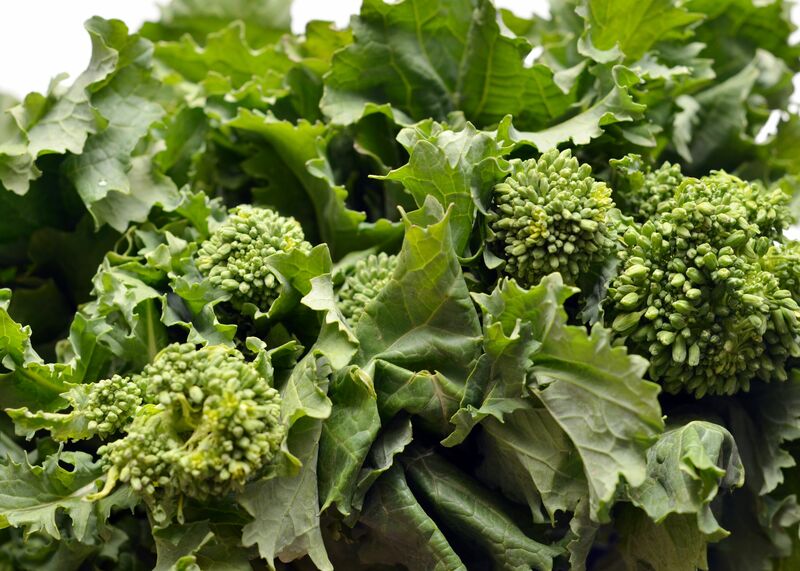 Broccoli rabe is a cool weather vegetable at its best in fall, early winter, and early spring. Warm weather encourages the plant to bolt (that's flowering to the less botanically inclined), which makes it even more bitter in flavor than usual. Look for bunches with large, dark green leaves with no yellowing or wilting. Any stalks with small buds that look like loose broccoli heads should be equally green and fresh looking. More and more stores carry rapini, but in some areas, you'll need to go to farmers markets, co-ops, or specialty stores to find it. Store broccoli rabe in a loosely closed plastic bag in the crisper of the fridge. Fresh-from-the-market broccoli rabe should last up to a week properly stored. If you don't like the bitterness of broccoli rabe (or any other cooking green, for that matter), blanch it in salted boiling water for a minute or two, drain, squeeze out any excess water, and then cook it. Blanching sets its green color but also leaches out much of the bitterness.